India has always been considered as a strong IT destination due to its young tech-savvy English speaking population. When being rated on Human sophistication, India comes just below two nations which are US and UK while on vendor sophistication; we are almost equal to Germany and share way better than China. This is being depicted in the IT Intellectual advantage chart being shown below in figure 1. (Source: Frost & Sullivan, 2006). Hence, the intellectual advantage is all there, but what India needs is that this knowledge should be passed to the grassroots. The challenging Indian mid-market needs an understanding of the advantages of technology as it helps them to integrate with large business supply chain for faster decision making and planned time management. Enterprise applications usage in India began way back in the early 1990’s when the large manufacturing enterprises started adopting ERP to streamline their processes through technology. Soon, the large enterprises from various verticals went into the bandwagon of adopting ERP, CRM and SCM solutions with the increasing complexities in their businesses. Presently, the Small and Medium Enterprises (SME’s) are also adopting these enterprise applications in a big way with the increased growth, awareness and the need to streamline the business processes. This rising demand from the mid-market has attracted the focus of most ERP vendors and has made this segment a very competitive one in the Indian market. According to Frost & Sullivan, the Indian Enterprise Applications software license Market crossed the $100 million mark in 2007. With an expected overall 10-year CAGR of 16.77 percent, the market is estimated to reach $372.05 million in 2015. 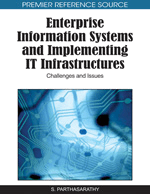 • Small and Medium Enterprises have been slow at information technology adoption. Adoption of IT tools low in priority. Feeling is that the same money can be utilized to improve and expand business. Short term focus towards financial gains. • Access Market International (AMI) study shows that only 3% of SMEs have a LAN at their office or factories, just 15% have internet connection, 4% have broadband and mere 1% have website. • An IDC survey shows that 80% of large enterprises were aware of ERP and this was less than 35% in case of SMEs.